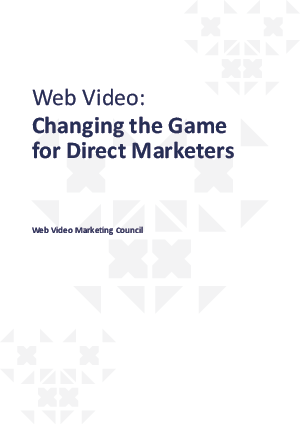 This report, which describes the emerging web video direct marketing category, discusses how online video marketing isn't just for advertisers anymore; explains the applications and benefits of interactive web video and in particular video landing pages for direct marketing, communications and sales; and explores how new technologies are enabling users to create, distribute and measure effective email video marketing campaigns without programming or advanced technical skills. Web video marketing is here. It presents exciting opportunities for marketers, communicators and salespeople because interactive audiovisual content is more engaging, interactive and responsive than static email and website content. Just as web video and rich media have changed brand advertising in recent years, video and rich media have the potential to change the rules of the game for direct marketing applications like email and paid search.